The concept for Sakara Kyoto started over ten years ago, with an American/Japanese couple creating comfortable holiday rental accommodation in Kyoto specifically designed for foreign visitors. Experience with renovating traditional buildings motivated us to design an Inn from the ground up, incorporating the features that are most important to travelers, while maintaining the traditional and natural feel of the Kyoto ‘machiya’ townhouses. We welcome traveling families. Staying at Sakara offers visitors the privacy and convenience of having their own apartment or house during their stay in Kyoto, while knowing that assistance is only a phone call or text message away. The staff is friendly and bilingual, so you can be sure that the reservations process will be smooth, and we are devoted to sharing our insider knowledge of Kyoto. The central and historical Higashiyama area was specifically chosen for several reasons; it is the home of Japanese Buddhism, there is convenient access to pubilc transportation, and downtown is walking distance away. A stay at Sakara is the best way to experience Kyoto and make the most of your time in the Old Capital. * Reservations by email only, please contact us for information and details. 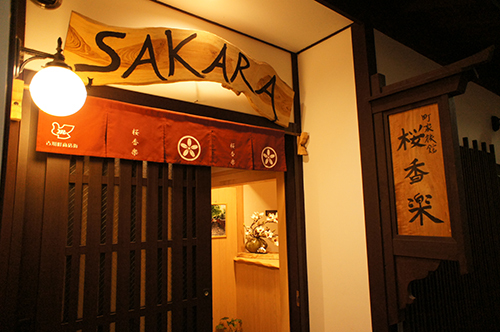 Sakara Kyoto offers several types of holiday accommodation in Kyoto to suit your needs. The Sakara Inn has double rooms, perfect for couples, and family suites for larger groups. • In the Furukawa pedestrian shopping arcade. • Taxi from Kyoto station: under 2000 yen. From SAKARA KYOTO, a 3-minute walk. 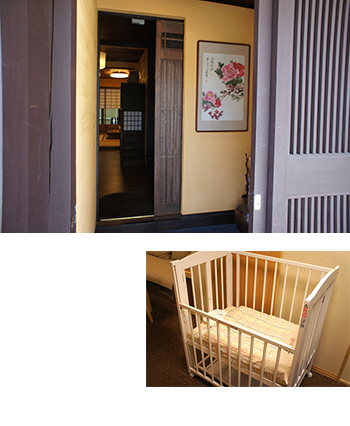 There is a baby bed set (crib/cot) that is available for babies and small children, at an additional rate of 3,000 yen in total for the duration of your stay. Stylish, clean, and safe, made in Japan. If you would like to reserve it, please contact us. • Taxi from Kyoto station: under 1700 yen.